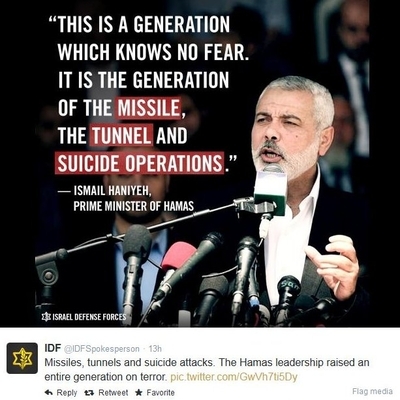 Hamas officials are notorious for making incendiary statements and anti-Semitic comments. In fact, their charter calls for the destruction of the Jewish state and the murder of Jews around the world. The terrorist organization's vendetta is not solely based on Israel's control of post-1967 territories, considering Hamas calls for the liberation of "historic Palestine" in its entirety. Recently, a senior Hamas official attempted to assure the Israeli Arab population that its missiles are only targeting the Jews, according to a video report by the Middle East Media Research Institute (MEMRI). "Not a single Arab Palestinian child will be hit by one of our missiles. Our rockets are aimed at the Hebrews, the murderers, the Israelis, the criminals," states the Hamas official. "Don't be afraid. Go on with your everyday life," adds the terrorist official, "and celebrate our victory, just like we will celebrate it here, in Gaza." Hamas is trying to foment civil unrest within Israel and the Palestinian territories by encouraging the celebration of its indiscriminate rocket fire on Israel's civilian population. The official also called for individuals to "besiege consulates of European countries supporting the occupation." "Rest assured, our missiles accurately target the homes of the Israelis and the Zionists." In addition to revealing Hamas' true anti-Semitic intentions, the statement simply isn't true. In June, a 3-year-old girl was killed in Gaza when a Hamas rocket aimed at Israel fell short. Two other children were killed in a similar misfire last November. Firing Katyusha and Grad type rockets are by their very nature indiscriminate. Rockets from Gaza have hit two Palestinian West Bank cities, Hebron and Bethlehem, during the conflict. One of the Israeli casualties in this most recent conflict was a Bedouin, and a 3-month-old girl was injured in the same attack. No doubt that's not who Hamas targeted. The terrorist groups' immediate goal is clear: to terrorize Jewish Israelis, hoping they will force Israel to accede to the terrorist organization's demands. In a speech on Wednesday, translated by the IPT, Hamas leader Khaled Meshaal spewed typical Hamas propaganda against Israel. Meshaal called on the various terrorist factions to join forces to strike Israeli civilian targets. "Al-Qassam Brigades, Al-Aqsa Brigades and Nasser Saladin Brigades, and Abu Ali Mustafa broke the prestige of the Occupation army." The Al-Aqsa Brigades, the military wing of Palestinian Authority President Mahmoud Abbas' Fatah movement, has boasted of its firing rockets from Gaza into Israel, according to another recent Middle East Media Research Institute (MEMRI). "The world only respects force … The Resistance prepared, built, smuggled and lay awake for its people, and was not sleeping. All the sons of Hamas, Fatah, Islamic Jihad and the Popular [Front] were born to resist the occupier," Meshaal said. The terrorist leader is trying to unite the Palestinian factions under Hamas' leadership, advocating for continued "resistance," which is code for indiscriminate rocket fire and other acts of terrorism against Israeli civilians. Hamas has said it considers all Israelis to be legitimate targets. When three Israeli teens were kidnapped and murdered in June, Meshaal tried to cast them as Israeli soldiers, even though two were only 16 years old. He did it again in this week's speech. "The Resistance nonetheless did not kill settlers," he said, "rather it killed soldiers, officers and leaders of the occupation army and its elites." "Our victims," he said, "are civilians and their dead are soldiers and military." The Israeli civilian casualty rate is relatively low because of Israel's Iron Dome Missile Defense system, which shoots down approximately 85 percent of Hamas' rockets targeted. Furthermore, Israel has constructed an elaborate warning system consisting of sirens and bomb shelters to protect its civilians. In addition, Israeli military forces have thwarted repeated Hamas attempts to use its vast tunnel network to sneak heavily-armed terrorists into kibbutzes and towns near Gaza in hopes of slaughtering as many civilians as possible. In contrast, by virtue of its guerrilla tactics, Hamas utilizes its civilians as human shields. The terrorist organization hides its weapons and continuously fires rockets from its own civilian population centers, including mosques, schools, private residences, and hospitals. Even when the Israeli military warns Gaza's civilians through text messages and leaflets to vacate certain premises, Hamas terrorists force their civilians to stay back. Understanding full well that Hamas forces are no match for the Israeli military, the terrorist organization attempts to foment international pressure against Israel by revelling in Palestinian collateral damage cloaked as Israeli "massacres." "We are the victim, despite our victory, we are defending our people….Netanyahu is the one who asked to stop the war; we know he is in trouble," Meshaal said. Again, Hamas' leadership engages in contradictory statements, portraying the terrorist organization as both suffering and victorious simultaneously. This statement also confirms that Hamas is responsible for the ongoing violence by rejecting multiple ceasefires, to which Israel adhered. Meshaal continues to demand that Israel first lift the blockade of Gaza and then Hamas will stop firing rockets. This latest conflict, which exposed a tunnel network far vaster than Israel estimated, shows that even with the legal blockade, weapons continue to be smuggled into Gaza. "Hamas leadership and its people and their blood are a sacrifice for the people of Gaza, Jerusalem, the [West] Bank and 1948," Meshaal said. Clearly, lifting the "siege" on Gaza would not end the conflict since the terrorist organization perceives that all of Israel is occupied territory and will not relinquish its terrorist tactics until the Jewish state is destroyed. When the solution is to kill everyone around you that doesn't think just exactly like you want them to, it's only a matter of time till you're the target of destruction.